D-Trick is that young man who along with his tagging crew hit up the upscale white suburb across the bridge to make their mark. While applying graffiti, D-Trick is approached by police officers and suddenly is imbued with powers. An ancient Native American source of mystical power called "power lines" forms a triangular shape that cuts across the mostly white California town and it's also the only place D-Trick can use his powers. Placing the kid from the other side of the tracks, a disenfranchised urban area, in unfamiliar territory but now with higher aspirations. Robinson touches on socially relevant issues like racism and police brutality. The unarmed D-Trick's thoughts as he's evading the police is hoping not to be shot to death. A poignant reminder of the realities of black lives lost at the hands of the police. The racism is clearly embodied by the lady whose purse was stolen by D-Trick's partner and her rant, while it almost makes her a caricature, isn't too far from reality considering what we've seen in this current political climate. This is a more grounded comic book story about characters we don't usually see especially a young black man as the primary hero. Let's not dwell too much on that aspect because there's more going on as the use of powers has a mysterious figure hidden in the shadows worried. A Native American man is concerned as the power lines have existed for thousands of years, often dormant, but it's return has raised an alarm. Robinson as usual does a wonderful job of bringing a bright world to life with sketchy drawings and bold pastels to infuse his panels. The characters convey so much in their expressions that emphasize their words even more. He has a style all his own that is always clean and clear. The layouts provide a wide scope of backgrounds and angles. It's almost unfair that Robinson does all his art and lettering and does it so well. He's making other artists look like slackers. 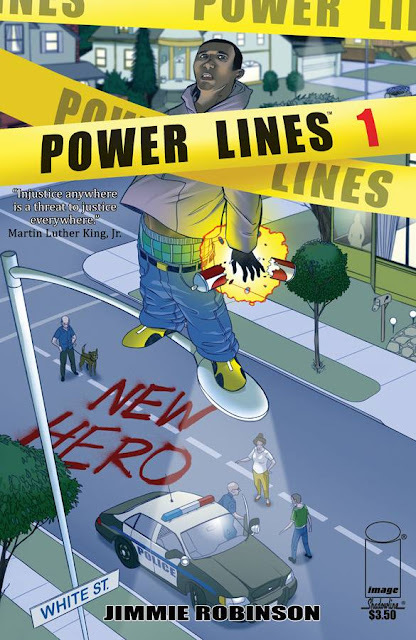 'Power Lines' is a unique and important series that uses familiar superhero tropes to inform about the real world. Robinson is blazing a trail mixing real issues with fantastical supernatural powers in a premiere issue that teases at darker forces. It raises some questions and places a person of color in the limelight for once. 'Power Lines' is definitely worth picking up.